Really enjoyed my stay, location is lovely. Staff were really helpful. I'd stay again and bring the family next time! When would you like to stay at YHA Keswick? Overlooking the River Greta and Fitz Park, with far reaching views to Latrigg and Skiddaw, YHA Keswick is a stunning, recently refurbished Lakeland hostel. The hostel also features a brand new Riverside Bar and Restaurant ,serving a varied menu of great food and drink. Less than five minutes' walk to the amenities of this busy tourist town, YHA Keswick is ideally placed for days out in the North Lakes Fells. For cycling, the hostel is perfectly placed on long distance routes including the the Coast 2 Coast. The ground floor social spaces have been re-configured to provide a newly opened reception/café bar and dining room with French doors opening over the river plus a new self-catering kitchen and social space with AV facilities and free wifi. In addition we now provide new guest accommodation on the first floor, all with en-suite bedrooms and river facing private balconies. Our Riverside Restaurant & Bar provides a contemporary, relaxed and cosy atmosphere away from the bustle of this busy market town. 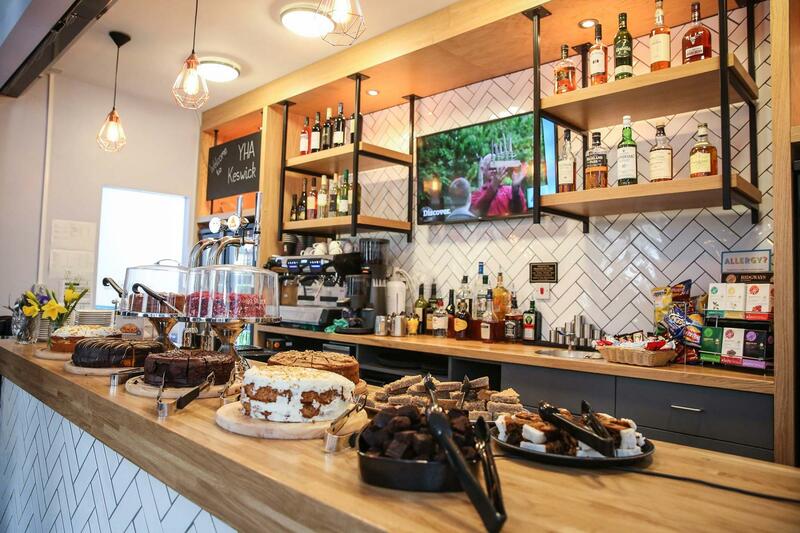 Offering a broad selection of delicious food, alongside a range of freshly made hot drinks and a well-stocked bar. Open daily to guests and passers-by, let us welcome you to rest your legs and indulge your senses after the day’s adventure. Whinlatter Visitors Centre is just five miles from YHA Keswick with some of the best purpose built single track mountain bike trails in the country. The C2C route is a 225km route traversing Northern England from Whitehaven or Workington on the West coast to Tynemouth or Sunderland on the east. For an accessible road-side route try Little Chamonix for an entry level climb. Within a three mile radius of Keswick you can try canoeing, sailing and kayaking, all available on Derwentwater. Offering multi-activity courses in everything from ghyll scrambling and zip-wires to raft-building and waterrollerz. Parking: There is only limited parking available on Station Road, however there is free parking 400m away. Pets: Pets are not permitted at YHA Keswick. Assistance dogs are welcome. Manager recommends: There’s great choice for walking holidays here in the Northern Lakes. Or try climbing Skiddaw, one of the highest mountains in the Lake District, which dominates the view across Fitz Park. Keswick is an excellent centre for all kinds of outdoor activity breaks including water sports, hiking holidays and cycling holidays. Don’t miss the view over Derwentwater in the evening - with a backdrop of the Borrowdale valley, best seen from Friars Crag.